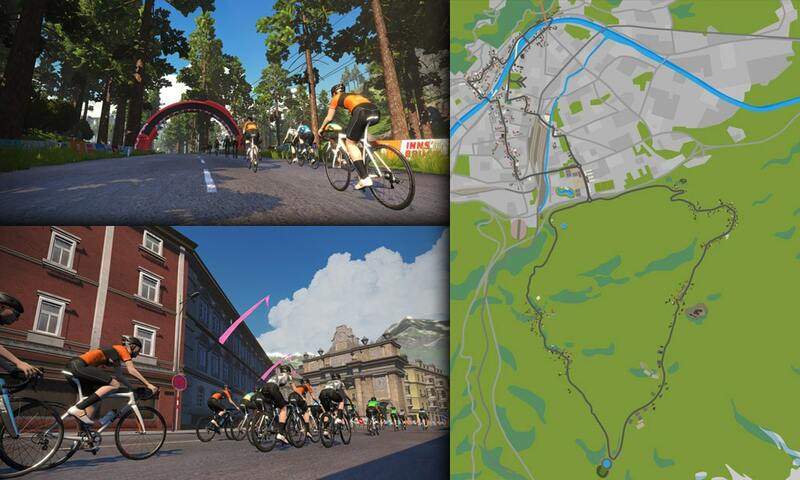 This page includes route maps and basic details for all Zwift routes on the Innsbruck course. Looking for other courses? Jump to Watopia Routes, New York City Routes, London Routes, or Richmond Routes. Innsbruck’s flagship route is actually just a portion of the 2018 UCI Worlds course which was raced in September 2018. It begins in Innsbruck on a flat road which crosses the Sill River then heads beneath the Inntal Autobahn overpass before hitting the big climb. At 7.4km (4.6 miles) with an average grade of 5.4%, the Innsbruck climb is similar to Watopia’s Epic KOM in terms of difficulty. Enjoy the descent, but don’t rest too much: you’ve still got a sprint coming! Head back into town and see if you can make the leaderboard for the sprint along the Inn River (the town’s namesake) before crossing the finish line. Innsbrucking is the flat(ish), “in town” portion of the Innsbruck course. Beginning and ending at the start/finish banner, this route makes a great crit race course thanks to the “Leg Snapper”, a 450m long, 8% climb located around 5km from the start. This hill forces an attack every lap. Save your feather power-ups! Any chance of reverse Innsbruckring and its sprint? Thanks!